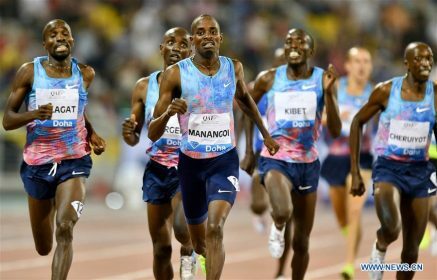 5th May 2017 – The outdoor season officially moved in to full swing at the opening IAAF Diamond League meeting in Doha and Bethwel Birgen (KEN) and Vincent Kibet (KEN) both had very encouraging performances. Coming off strong indoor seasons that saw Bethwel win the World Indoor Tour both ran tactically well and finished strongly to take third and fourth positions respectively. Despite the unusually blustery conditions the first eight clocked the fastest times in the world so far this year with Bethwel posting 3:32.27 and Vincent 3:32.66 for 1500m. In the US, at her home track of Hayward Field, Jenna Prandini was a comfortable winner of the 100m at the Oregon Twilight meeting in 11.29 seconds. On the roads Duncan Maiyo (KEN) battled with the wind and rain to take third place at the Geneva Marathon.